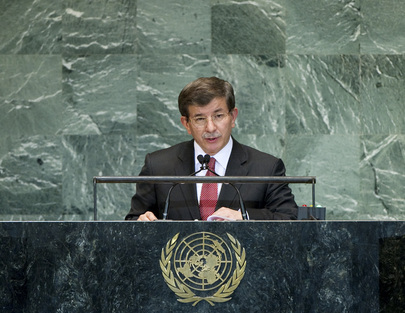 AHMET DAVUTOĞLU, Minister of Foreign Affairs of Turkey, said: “On many matters, we speak as one, yet we fail to act in unity.” Each year there was a commitment to solve frozen conflicts in Palestine, the Nagorno-Karabakh region and in Cyprus, and they remain unresolved. And “while we cannot resolve current problems, each year we find ourselves besieged by ever-mounting new ones”. In that respect, he said the world was now witnessing indiscriminate attacks and the collective punishment of civilians by a cruel regime in Syria. “If we fail to hear and rise up to the cry of innocent masses wherever they are, and if we cannot force these brutal regimes to submit to justice and the rule of law, how are we to maintain international peace and security?” he asked. Indeed, the international community’s inability to act had become a “tool in the hands of despots and destructive regimes to demolish their cities, towns and villages, massacre their own citizens and make a mockery of the civilized world and the United Nations”. “Let us make no mistake”, he added, “mercy shown to an oppressor is the most merciless act towards people under oppression”. He underlined that the recent attacks against the Prophet Muhammad and against Islam were outright provocations that aimed to pit nations and peoples against each other. Turkey condemned all sorts of incitement to hatred and religious discrimination against Muslims and peoples of other faiths. Unfortunately, Islamophobia had become a new form of racism, like anti-Semitism, and it could no longer be tolerated “under the guise of freedom of expression”. Freedom did not mean anarchy, he stressed in that respect; instead, it meant responsibility. At the same time, he condemned the provocation and violence that followed, saying it “cannot be justified under any pretext”. Because of the alarming increase in the number of acts that defame religions, he believed the time had come to establish the denigration of all religions and their followers as a hate crime. He called for a universal policy and legal instrument that, while protecting free expression, should also ensure respect for religion and prevent intentional insults against faiths. “The solution should not be arbitrary,” he added, calling on the United Nations, in particular, to lead that effort and provide the international legal framework. The people of Syria had suffered under the brutality and the tyranny of the regime in Damascus for the last 18 months, he went on, stressing that more than 30,000 people had been killed so far and around 300,000 had fled to neighbouring countries, such as Turkey. About 1 million people were internally displaced. Unfortunately, however, “this humanitarian tragedy has become just a statistic for many”. There could be no legitimate explanation for the failure of the Security Council to reflect the collective conscience of the international community by stopping the violence of the Syrian regime. “The responsibility to protect the people of Syria is our fundamental duty,” he stressed, not least because the situation in the country had evolved into a real threat to regional peace and security.